Click on pictures above to enlarge and see captions. Nomadic hunter-gatherers pass through the area leaving behind arrowheads, potshards and pictographs six thousand years ago. About 1,000 years ago the people of Taos Pueblo and Picuris Pueblo inhabit their villages. The Taos Pueblo, which borders the town of Taos on its north side, has been occupied for nearly a millennium. It is estimated that the Pueblo was built between 1000 and 1450 A.D., with some later expansion, and the pueblo is considered to be one of the oldest continuously inhabited communities in the United States. Located in a tributary valley off the Rio Grande, it is the most northern of the New Mexico Pueblos. The Pueblo home rises five stories high, is a combination of many individual homes with common walls. There are over 1,900 people in the Taos Pueblo community. Some of them have modern homes near their fields and stay at their homes on Taos Pueblo during cooler weather. There are about 150 people who live at the pueblo year-around. The Taos Pueblo was added as an UNESCO World Heritage Site in 1992. Conquistador Hernando de Alvarado follows the Rio Grande north to Taos Valley in 1540 and arrives to see the sun shining on the straw in the adobes at Taos Pueblo, he believes he has found the famed Cities of Gold. Taos was established 1615 when Don Fernando de Taos, following the Spanish conquest of the Indian Pueblos, settled in Taos. Initially, relations of the Spanish settlers with Taos Pueblo were amicable, but resentment of meddling by missionaries, and demands for a tribute by the encomenderos (a Spaniard appointed by Spanish monarch with the task of "protecting" a specific group of Native Americans for a fee), led to a revolt in 1640; the Tewa people killed their priest and a number of Spanish settlers. In 1680, Taos Pueblo joined the widespread Pueblo Revolt. After the Spanish conquest of 1692, Taos Pueblo continued armed resistance to the Spanish until 1696, when Governor Diego de Vargas of Spain resettled the area around Taos Pueblo, Taos Plaza and Ranchos de Taos. 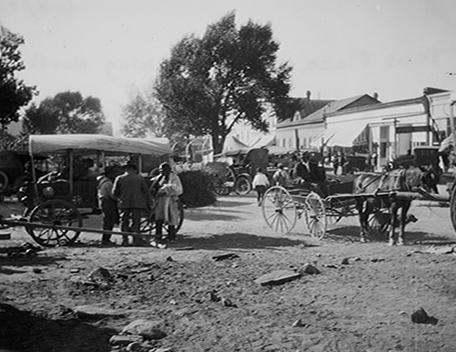 Between 1780 and 1800, Taos was firmly established by the Don Fernando de Taos Land Grant that gave land to 63 Spanish families in the Taos valley. It was built as a fortified plaza with adobe buildings and is now a central plaza surrounded by residential areas. Taos becomes the headquarters for mountain men, such as Kit Carson, who marries Taoseña Josefa Jaramillo. 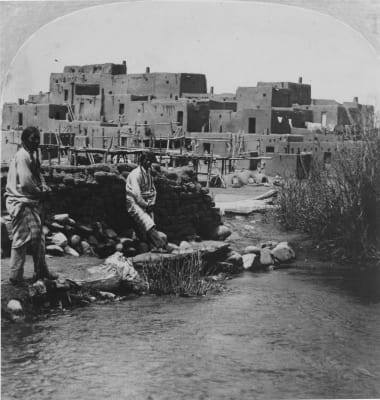 Mountain men who trapped for beaver nearby made Taos their home in the early 1800s. In 1826 Padre Antonio Jose Martinez begins serving the Taos parish. He starts the first newspaper west of the Mississippi, an offshoot of which is still in existence today. Mexico ceded the region to the U.S. in the Treaty of Guadalupe Hidalgo in 1848 after the Mexican–American War. After the U.S. takeover of New Mexico in 1847, Hispaños and American Indians in Taos staged a rebellion, known as the Taos Revolt, in which the newly appointed U.S. Governor, Charles Bent, was killed by Taoseños during the war with Mexico in 1847. New Mexico was a territory of the United States beginning 1850 and became a State in 1912. For historical reasons, the American flag is displayed continuously at Taos Plaza (both day and night). This derives from the time of the American Civil War, when Confederate sympathizers in the area attempted to remove the flag. The Union Officer, Kit Carson. sought to discourage this activity by having guards surround the area and fly the flag 24 hours a day. In 1898 artists Bert Phillips and Ernest Blumenschein stopped to have a broken wagon wheel repaired, they became enchanted with Taos and decide to stay. 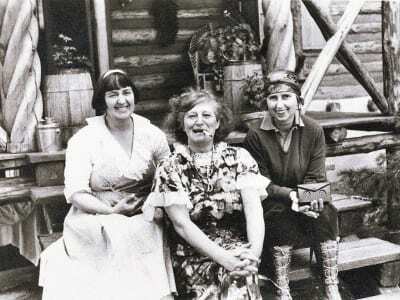 Artists began to settle in Taos; six formed the Taos Society of Artists in 1915. In time, the Taos art colony developed. Many paintings were made of local scenes, especially of Taos Pueblo and activities there, as the artists often depicted the Tewa People and the Pueblo in their paintings. Some of the artists' studios have been preserved and may be viewed by visitors to Taos. These include the Ernest L. Blumenschein House, the E. Irving Couse House and Studio, Joseph Henry Sharp Studios, and the Nicolai Fechin house, all of which are listed on the National Register of Historic Places. Influential later 20th-century Taos artists include R. C. Gorman and Agnes Martin. 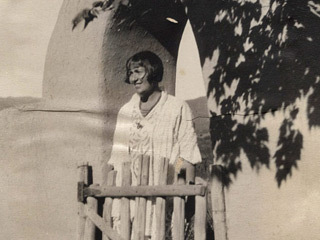 New York socialite, Mabel Dodge Luhan – salon hostess, art patroness, writer and self-appointed savior of humanity – arrived in Taos in 1917 she married Tony Luhan and established her home. She entertained some of the greatest minds of the 20th century; Georgia O’Keeffe, D.H. Lawrence, Ansel Adams, Carl Jung, Willa Cather, Thorton Wilder, Thomas Wolfe, Nicolai Fechin and Martha Graham. The Town of Taos was incorporated as a general law municipality on May 7, 1934. Ernie and Rhoda Blake open Taos Ski Valley in 1955. The first lift goes up Al's Run for 300 vertical feet and is 1,000 feet long. Now the highest point is Kachina Peak with a new lift built in 2014 to whisk skiers and snowboarders to spectacular views of the Spanish Peaks to the north, the Taos Plateau to the west and Wheeler Peak, the highest mountain in New Mexico, to the northeast. Summer lift riders are also welcome in July & August, enjoy new heights in Taos, New Mexico. The second highest suspension bridge in the U.S. highway system is built spanning the Rio Grande Gorge in 1965. It is called the "bridge to nowhere" while it is being built, because the funding does not exist to continue the road on the other side. NM State Highway did continue to connect the forests and communities of northern New Mexico and fifty years later the recently paved Rim Road gives Taseños and visitors quick access to the western most areas of our county. By 1969 there were at least six hippie communes near Taos: Five Star had a winning baseball team; Morning Star had the largest collection of battered vehicles; Reality Construction Company had guns and anarchy; the Hog Farm had psychedelic buses and Wavy Gravy; New Buffalo had irrigated farmland; Lama had meditation, rules, and American spiritual leader and author, Ram Dass. In 1970 the U.S. government returns sacred Blue Lake to Taos Pueblo in a landmark decision. 2015 President Barack Obama proclaims the Rio Grande del Norte National Monument, 236,000 acres or the Rio Grande Gorge and surrounding area from just south of Taos to the state border with Colorado. Taos is now a community overflowing with a long proud history, three cultures living side by side, and a heritage of colorful people. Its diversity makes Taos a very interesting and desirable place to live and do business.